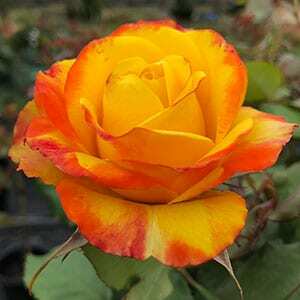 A hybrid tea rose, Tequila sunrise has golden flowers that are blushed with red along the edges of the petals. The combination of colours gives it a glow that reminds of the sunrise, hence the name. Released in 1989, this is a David Austin rose and it has become a classic. It is strong growing, disease resistant and the bright flowers add a liveliness to the garden. Reaching to around 80cm to 1 metre in height it also arose well suited to growing in containers. Fragrance is sweet but not strong. 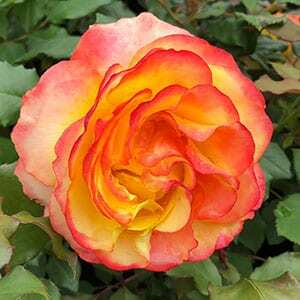 If you are looking for an award winning rose with bright flowers Tequila sunrise is one to consider. Use it as a feature plant in the general garden border or rose garden or in a container on a patio.